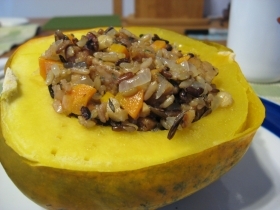 Have you made Acorn Squash & Wild Rice? 1. Preheat the oven to 350 degrees (F). 2. 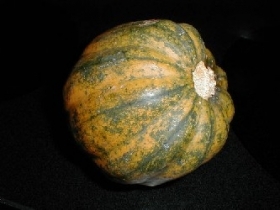 Cut each squash in half and remove the seeds and pulp. 3. 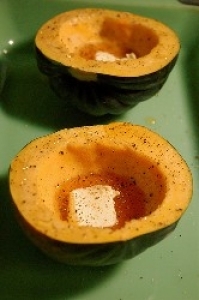 In a large baking dish, place the squash, cut side down, with about 1 inch of water. 4. Bake until tender, about 45 minutes. Pour about 2 inches of water into a large stockpot. 5. Place a collapsible steamer in the pot, cover, and bring to a boil. 6. Place the Brussels sprouts in the steamer, cover, and steam for 5 to 7 minutes, or until tender. 7. Set aside. Meanwhile, in a large skillet, heat the oil over low heat. 8. Add the onion and saute for 10 minutes, stirring frequently. 9. Stir in the fennel, marjoram, sage, orange juice, lemon juice, and pepper, and simmer for 3 minutes. 10. Stir in the cooked wild rice and the Brussels sprouts and heat through. 11. 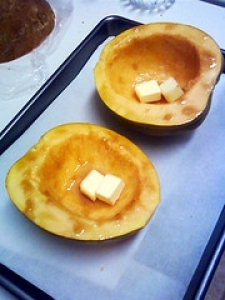 Spoon the wild rice and Brussels sprout mixture into the squash cavities. 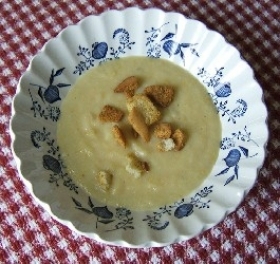 This recipe is high in Vitamin A with 22% of your daily recommended intake per serving. 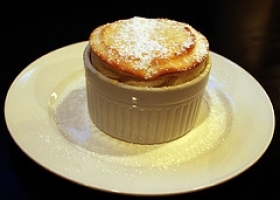 This recipe is high in Vitamin C with 88% of your daily recommended intake per serving. 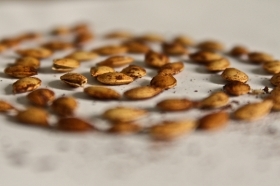 This recipe contains potential food allergens and will effect people with Wheat, Lemon, Gluten, Rice, Sulfites, Fructose Malabsorption, Onion, Olive Oil allergies.